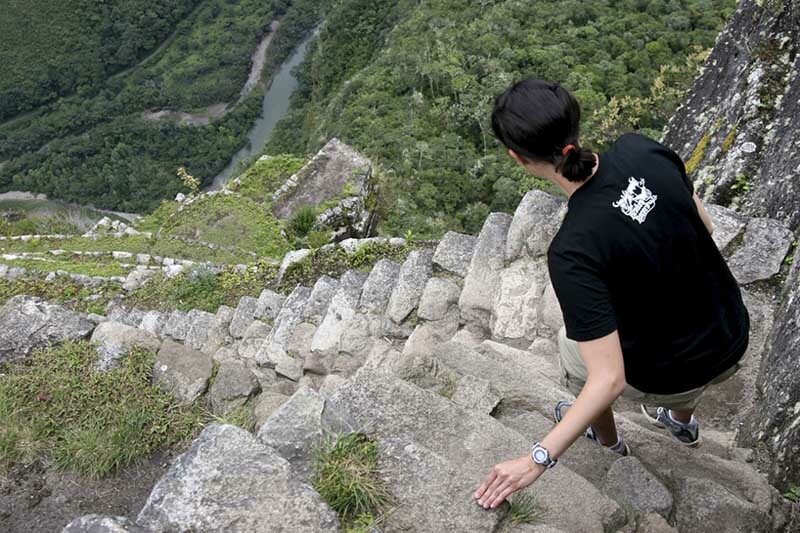 The narrowness of the Huayna Picchu trails make it few people can be on the mountain at the same time. There are 400 tickets available to ascend to this mountain and are divided into 2 groups; The first group enters from 7 to 8 am and the second group does from 10 to 11 am. This very limited availability means that you have to reserve tickets to Huayna Picchu months in advance, otherwise you may have to adjust to the remaining dates and times available. Surely you have seen some of the millions of photos of Huayna Picchu on the web, then you should know that Huayna Picchu is the mountain that appears as a background in the typical postcards of the Inca city of Machu Picchu. The entrance control to the mountain Huayna Picchu is to the north of the Inca city, just behind the area where the “sacred rock” is located . If you have already decided to climb the mountain Huayna Picchu, let nothing stop you, many people have experienced incredible sensations, after reaching the top of this mountain. The Huayna Picchu mountain roads are well signposted and you will be safe as long as you stay in them. Searching for a road on his own is so dangerous that if he fell, he would surely find death; So please, for your safety, stay within the indicated trails. Much of the way through Huayna Picchu is surrounded by thick vegetation, this delimits the paths and will allow you to move forward with tranquility, but you have to put all your attention on the road, do not be distracted by the beautiful views, you will have time to take the Best views from the top of the mountain. The Huayna Picchu mountain trails lie between the walls of the mountain and the Canyon formed by the Urubamba River; The road is made of stone and can be very slippery due to the humidity of the morning and although coming in rainy weather to Machu Picchu can give you lush landscapes, the best time to travel this mountain is in the dry season (April to October). The roads of Huayna Picchu Mountain are visually terrifying, narrow, so impressive that they cause vertigo. The steps of the Huayna Picchu are known as the stairs of death and are among the most terrifying in the world, the steps are on average 35 cm high, 70 cm wide and 15 cm deep, on one side of them you will find the walls Of the mountain and to the other, an exposed fall of about 350 m, direct to the Urubamba river. While walking the mountain Huayna Picchu be sure to do it with a small backpack, which allows you to carry what you need and have your hands free, you will need to hold onto the rocks and safety lines you found on the way. 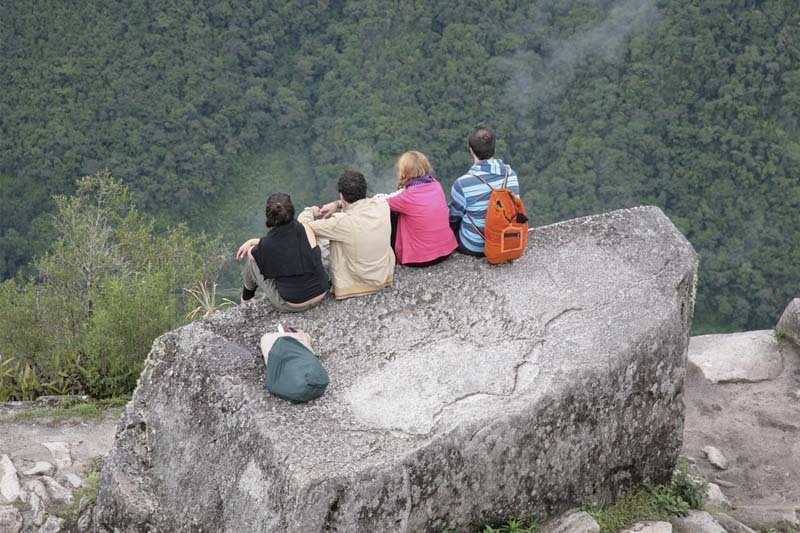 The tour of the Huayna Picchu is considered among the most amazing experiences of the planet, so go ahead. The mountain offers something more incredible than the trail itself; Unique and privileged views, reserved only for those who manage to reach the top. Not only will you get beautiful 360º panoramic views of the Inca city of Machu Picchu, but also the amazing mountain environment that surrounds it, imagine the Inca city of Machu Picchu, with the Andes mountain range behind and the serpentine Urubamba river surrounding it. Enjoy the beautiful natural setting that envelops and protects one of the wonders of the world. The top offers more of a reward, after taking the best views you can get from there, there is still more, the descent will give you the opportunity to see one of the most amazing constructions of the National Park of Machu Picchu, the Temple of the Moon. A circular road will take you back to the Inca city, with enough time to continue appreciating it. Most people who visit Machu Picchu agree that the Huayna Picchu mountain is the “cherry pie” of this unique adventure. If you enjoy the mountain as it should, you will want to relax “as it should”, and the hot springs of Aguas Calientes (Machu Picchu village) are the best place to do it. Your physical integrity is under your responsibility, so be careful while walking the trails of the magnificent Huayna Picchu mountain. Nevertheless you will have the full support of security personnel, inside and outside of Machu Picchu; They will be attentive to any inconvenience that may occur during your visit. How is security in Huayna Picchu? 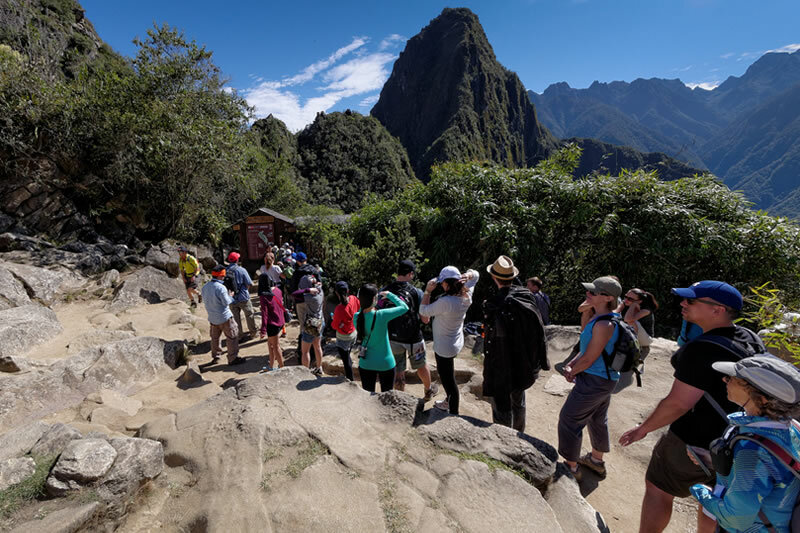 In order to ascend to Huayna Picchu Mountain, you must register in the control of income, you must provide your personal information, name, identity card, date and time, to register in the guestbook; The same procedure must be performed upon exiting. In this way you can verify that all the people that entered the mountain come out. An important number of agents, will take care of you during your visit, civilians and pólice. But others will also watch over you incognito. But that’s not all, there are high definition cameras strategically placed throughout the sanctuary. How to report an emergency? You can report them with “Tourism Police Peru“, a free application available for smartphones and tablets, through which you can report any emergencies that may arise during your travel. The digital communication will allow the agents to respond immediately, in case of an emergency . You can also report your emergencies directly to Aguas Calientes Police Station , located at Av. Hermanos Ayar, very close to the town square or contact them, calling +51 – 084-211178. But you will find police officers In the village of Aguas Calientes (Machu Picchu village). Keep in mind that in Machu Picchu, as in all tourist cities, you should be careful with your belongings, do not lose sight of them during your tour.